Purchasing online can be a minefield. Will the quality of the product be superior? Just because it’s more expensive doesn’t mean it will be any good. Not seeing what you’re buying makes the whole experience a very cautious time. As an individual who has a passion for bringing back old fashioned values, when purchasing goods I have chosen to use my skills in sewing to bring about CoverIT. I want my customers to get the best quality product, with the service that you expect, all for the right price. I have taken time to think about the products and how best to make them so they are durable and have reinforcement in the places where strain will occur. Each cover is made with high quality tarpaulin and then sewn using UV resistant thread that will not rot. 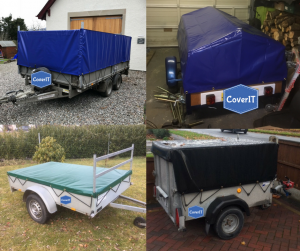 When hems are added to our standard or ramp tailgate covers, they are continuous around the whole cover tying together all the sides to make it stronger. On opening back/front covers the velcro® is self adhesive but is also sewn on down both edges so that over time there are no issues with the velcro® coming away. The side edges of the cover have tarpaulin binding down their length to protect against wear. An opening front cover has the front panel on the outside with the two side panels folding round underneath it. This is so that when travelling, the force of the slipstream on the front panel will keep the sides in place. The back panel however is the opposite way around so that as the slipstream travels the length of the trailer it doesn’t rip open the sides. All ladder rack holes have tarpaulin binding around them as this will reduce wear as the cover rubs against the metal posts. Around the hem are solid brass eyelets used because they do not rust and we place these at approximately 30cm apart so that the cover will not have to distort in order to get the shock cord to the nearest cleat. Finally we supply 8mm shock cord as standard to give added strength when traveling. As we all know, after purchasing your product it is human nature to want it as soon as possible so we always aim to dispatch the day after ordering and it usually then takes 1-2 days for delivery unless it is a busy time of year.